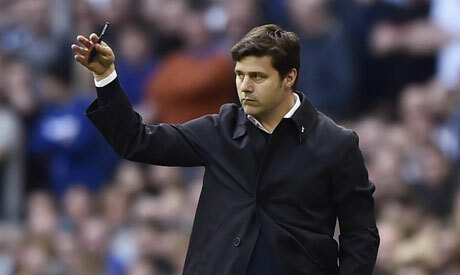 Tottenham Hotspur manager Mauricio Pochettino described his injury-hit side as "heroes" after they came close to salvaging an unlikely Champions League draw against a Lionel Messi-inspired Barcelona at Wembley on Wednesday. Tottenham, who were missing the likes of Dele Alli, Christian Eriksen and Jan Vertonghen, conceded after two minutes to Philippe Coutinho and were stunned after 28 by Ivan Rakitic's sublime volley -- both goals initiated by Messi passes. The Argentine scored two goals after the break, and hit the post twice, as Barcelona won the Group B thriller 4-2 but Tottenham kept bouncing back with Harry Kane and Erik Lamela twice getting them to within a goal of the visitors. "You have to look at the reality and to have that handicap against Barcelona and compete like we did in the second half, I think the players are heroes," Pochettino, whose side have lost both their Group B games, told reporters. "It was a tough game. When you concede in less than two minutes, it changes completely the plan. "The emotion becomes tough when you are playing against Barcelona and players like Messi and Suarez. That is why I want to congratulate the team, because we were always on the game, always fighting, never giving up. I feel so proud. "Disappointed with the result but the effort was massive." Despite Messi playing a key role in Barca's two first-half goals, Pochettino felt his side had kept him quiet until the interval, but admitted he ran them ragged in the second half. "What Messi does doesn't surprise me," Pochettino said of his compatriot who has scored 105 Champions League goals in 127 appearances. "But we conceded the first goal in the first minute and when that happens it sets up the game. When Messi has space the way he runs and dribbles is unbelievable. He can finish you off." At 31, Messi should be slowing down but he was on another level to every other player on the pitch. "Messi is the best in the world, and I must say he's the best in history in my opinion," Coutinho said. "Everything he does is so unpredictable. I'm thrilled for him that he scored twice tonight." Barcelona arrived at Wembley on the back of three La Liga games without a win, but produced a dazzling display of attacking soccer to put themselves in a strong position before their Champions League clashes with Inter Milan. "We knew it was a very difficult group and we knew this would be a key game because it was at Wembley and because it was Tottenham Hotspur," coach Ernesto Valverde said. "I hope the fans are happy with the players."